Plantar fasciitis is a poorly understood condition. There is little consensus among medical professionals about what causes the problem, and no treatments have been reliably proven to treat it. A number of theories exists for why plantar fasciitis develops, but the ineffectiveness of conventional treatments suggests something is missing. The plantar fascia is a band of connective tissue that runs along the underside of the foot from the heel to the toes. The fascia helps maintain the integrity of the arch, provides shock absorption, and plays an important role in the normal mechanical function of the foot. This is a problem of either extreme, so people with high arches or those that have very flat feet are at risk of developing pain in this region. This is because of the relative stress the plantar fascia is put under. In people with excessive pronation, the plantar fascia is put under too much stretch, as their range flattens and strains it. People with a stiff, supinated (high-arched) foot lack the flexibility to appropriately shock absorb, so this too puts extra strain on the plantar fascia. Clinically, we see more people presenting with plantar fascia pain who have excessive pronation than those with stiff, supinated feet. But while the foot type is the biggest risk factor for plantar fasciitis, the whole leg from the pelvis down can affect how the foot hits the ground. A thorough biomechanical assessment will determine where in the kinetic chain things have gone wrong to cause the overload. You'll typically first notice early plantar fasciitis pain under your heel or in your foot arch in the morning or after resting. Your heel pain will be worse with the first steps and improves with activity as it warms up. As plantar fasciitis deteriorates, the pain will be present more often. You can determine what stage your are in using the following guidelines. No Heel Pain, Normal! Heel pain after exercise. Heel pain before and after exercise. Heel pain before, during and after exercise. Heel pain all the time. Including at rest! This symptom progression is consistent with the four stages of a typical overuse injury. Ultimately, further trauma and delayed healing will result in the formation of calcium (bone) within the plantar fascia. When this occurs adjacent to the heel bone it is known as heel spurs, which have a longer rehabilitation period. In many instances, plantar fasciitis can be treated with home care. Changing your physical activities, resting the foot, and applying ice to the area are common remedies. Taking over the counter medications such as ibuprofen or acetaminophen can help reduce pain and inflammation that may have developed. 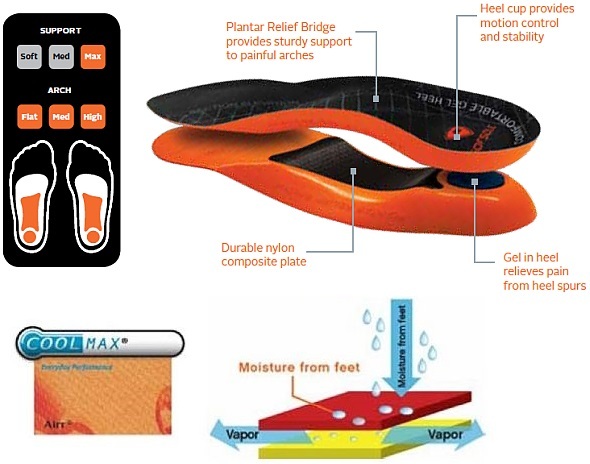 An orthotic device placed in your shoes can also significantly help to reduce pain. In addition, orthotics can also help promote healing to reverse plantar fasciitis. If pain from plantar fasciitis continues despite conservative treatments, you may need to visit a doctor or podiatrist. It's important to seek medical advice before heel pain and damage becomes worse. If the condition is allowed to worsen, more serious or invasive forms of treatment may be required to stop pain. A visit to a doctor may reveal other conditions affecting the foot as well, such as Achilles tendonitis, heel spurs, or other heel pain conditions. An x-ray may also be taken, which can reveal the presence of a heel spur. In rare cases surgery may be required to release tension on the plantar fascia, or to remove a portion of a heel spur. But again, most heel pain conditions can be resolved using conservative treatment.